Shipments of exclusive, literary-themed merchandise began this week and will arrive at participating stores in time for Independent Bookstore Day on Saturday, April 27. Booksellers and publishers attending the seventh ABC Children’s Institute can register now for full-day or half-day bookstore tours or to participate in a quidditch match. Booksellers can register now for all ABA programming at BookExpo 2019, which includes Meet the Editor, Publicists Speed Dating, the Children’s Book Art Silent Auction, the ABC/CBC Speed Dating Tea, and more. This opportunity will allow booksellers “to engage with their peers on topics and issues important to them and the larger bookselling community,” said ABA Senior Education Manager Lisa Winn. Here from ABC Children’s Group Manager Gen de Botton is a special invitation to booksellers attending the seventh ABC Children’s Institute (Ci7) in Pittsburgh this June. Saturday, April 27, will mark the fifth annual Independent Bookstore Day, a one-day party taking place at indie bookstores nationwide. Booksellers are encouraged to sign up for one-on-ones with members of ABA’s IndieCommerce team, open to current IndieCommerce and IndieLite members as well as to non-members. Attending booksellers will meet with groups of editors from participating publishers in one of two shifts to talk about their newest books. BookExpo can be both exciting and overwhelming. For booksellers who have never attended or those who want to maximize their time at the show, here’s a checklist to help you draft a plan of action. 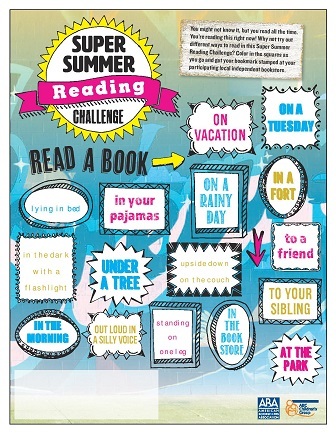 The entire collection of the ABC Group’s Super Summer Reading Challenge can be downloaded from BookWeb’s Marketing Assets page now. The program is open to all ABA member bookstores. Well-Read Black Girl founder Glory Edim and ABA have also announced their three suggested titles for WRBG book clubs to try this May: a debut, a paperback, and a YA title. The April 10 issue of BTW will feature a link to an online form booksellers and other industry professionals can use to pitch topics for Winter Institute education sessions along with presenters and moderators. At the event in Pittsburgh, Pennsylvania, this June, the actress and lifelong activist will discuss her debut children’s book series, Hope.